Common base for all Server classes used to manage connections from clients. Definition at line 28 of file Server.h. Definition at line 24 of file Server.cc. Reimplemented in Ftp::Server, and Http::One::Server. Definition at line 32 of file Server.h. References afterClientRead(), connFinishedWithConn(), doneAll(), handleReadData(), readSomeData(), size, start(), and swanSong(). Referenced by doClientRead(), and ~Server(). Definition at line 83 of file Server.h. Will call afterClientWrite(size_t) to sync the I/O state. Then writeSomeData() to initiate any followup writes that could be immediately done. Definition at line 186 of file Server.cc. References afterClientWrite(), clientConnection, CommCommonCbParams::conn, debugs, Comm::ERR_CLOSING, Comm::Connection::fd, CommCommonCbParams::flag, Pipeline::front(), Comm::IsConnOpen(), Must, pipeline, CommIoCbParams::size, writer, and writeSomeData(). Definition at line 102 of file Server.cc. References afterClientRead(), assert, checkLogging(), StatCounters::client_http, clientConnection, Comm::Connection::close(), commMarkHalfClosed(), CommCommonCbParams::conn, connFinishedWithConn(), debugs, Comm::ENDFILE, Comm::ERR_CLOSING, Comm::Connection::fd, fd_note(), fd_table, CommCommonCbParams::flag, handleReadData(), inBuf, Comm::INPROGRESS, Comm::IsConnOpen(), SBuf::isEmpty(), StatCounters::kbytes_in, maybeMakeSpaceAvailable(), Must, NULL, Comm::OK, pipeline, reader, reading(), Comm::ReadNow(), readSomeData(), receivedFirstByte(), receivedFirstByte_, CommIoCbParams::size, statCounter, Pipeline::terminateAll(), CommCommonCbParams::xerrno, and xstrerr(). Definition at line 33 of file Server.cc. References clientConnection, AsyncJob::doneAll(), and Comm::IsConnOpen(). Do not read too few bytes at a time. Do not waste too much buffer space. Do not [re]allocate or memmove the buffer too much. Definition at line 70 of file Server.cc. References SBufReservationRequirements::allowShared, CLIENT_REQ_BUF_SZ, Config, debugs, SBufReservationRequirements::idealSpace, inBuf, SBufReservationRequirements::maxCapacity, SquidConfig::maxRequestBufferSize, SBufReservationRequirements::minSpace, SBuf::reserve(), and SBuf::spaceSize(). Referenced by doClientRead(), and writing(). Implemented in ConnStateData, Adaptation::Icap::ModXact, Ftp::Server, Client, Adaptation::Ecap::XactionRep, and Http::One::Server. Referenced by BodyPipe::expectNoConsumption(), and BodyProducer::~BodyProducer(). Referenced by BodyPipe::postConsume(), and BodyProducer::~BodyProducer(). Definition at line 57 of file Server.h. References NULL, reader, receivedFirstByte(), and stopReading(). Referenced by doClientRead(), readSomeData(), and stopReading(). Definition at line 85 of file Server.cc. References clientConnection, Config, debugs, doClientRead(), inBuf, JobCallback, SBuf::length(), SquidConfig::maxRequestBufferSize, Comm::Read(), reader, and reading(). Referenced by clientNegotiateSSL(), doClientRead(), Http::One::Server::noteMoreBodySpaceAvailable(), ConnStateData::parseTlsHandshake(), Http::One::Server::start(), ConnStateData::switchToHttps(), Ftp::Server::wroteEarlyReply(), and ~Server(). Referenced by doClientRead(), and reading(). Reimplemented in ConnStateData, Ftp::Server, and Http::One::Server. Definition at line 41 of file Server.cc. 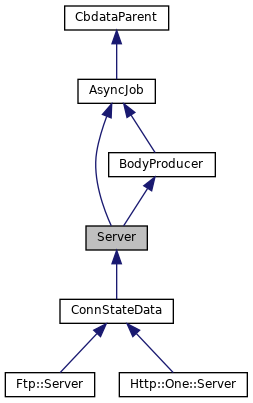 Referenced by Ftp::Server::AcceptCtrlConnection(), Ftp::Server::checkDataConnPre(), clientListenerConnectionOpened(), Ftp::Client::connectDataChannel(), TunnelStateData::connectedToPeer(), FwdState::connectStart(), TunnelStateData::connectToPeer(), Adaptation::Icap::Xaction::dnsLookupDone(), Log::TcpLogger::doConnect(), FwdState::establishTunnelThruProxy(), Ipc::Coordinator::handleCacheMgrRequest(), PeerPoolMgr::handleOpenedConnection(), Ipc::Coordinator::handleSnmpRequest(), httpAccept(), httpsAccept(), httpStart(), idnsInitVC(), Adaptation::Initiator::initiateAdaptation(), Ftp::Gateway::listenForDataChannel(), Ftp::Server::listenForDataConnection(), Adaptation::Icap::Xaction::noteCommConnected(), Log::TcpLogger::Open(), PeerPoolMgr::openNewConnection(), peerProbeConnect(), Rock::SwapDir::rebuild(), Mgr::FunAction::respond(), Mgr::InfoAction::respond(), FwdState::secureConnectionToPeerIfNeeded(), Ipc::SendMessage(), Mgr::Inquirer::sendResponse(), snmpConstructReponse(), SquidMain(), Ident::Start(), Adaptation::AccessCheck::Start(), CacheManager::start(), Security::PeerConnector::startCertDownloading(), TunnelStateData::startConnecting(), Ftp::StartGateway(), Ftp::StartRelay(), PeerPoolMgrsRr::syncConfig(), and Rock::SwapDir::updateHeaders(). Definition at line 56 of file Server.cc. References clientConnection, Comm::Connection::fd, NULL, Comm::ReadCancel(), reader, and reading(). Referenced by ClientHttpRequest::processRequest(), and reading(). Definition at line 47 of file Server.cc. References clientConnection, Comm::Connection::close(), Comm::IsConnOpen(), and AsyncJob::swanSong(). Referenced by ConnStateData::swanSong(), and ~Server(). Definition at line 69 of file Server.h. References clientConnection, clientWriteDone(), JobCallback, Comm::Write(), and writer. Referenced by Http::Stream::sendBody(), and Http::Stream::sendStartOfMessage(). Definition at line 76 of file Server.h. Definition at line 66 of file Server.h. Definition at line 86 of file Server.h. References maybeMakeSpaceAvailable(), NULL, and writer. Definition at line 97 of file Server.h. Referenced by Ftp::Server::acceptDataConnection(), Format::Format::assemble(), Auth::UserRequest::authenticate(), ConnStateData::buildFakeRequest(), Http::One::Server::buildHttpRequest(), ConnStateData::buildSslCertGenerationParams(), Ftp::Server::callException(), ClientHttpRequest::calloutsError(), IdentLookup::checkForAsync(), clientAclChecklistFill(), ClientHttpRequest::ClientHttpRequest(), clientIdentDone(), clientNegotiateSSL(), Ftp::Server::clientPinnedConnectionClosed(), ConnStateData::clientPinnedConnectionClosed(), ConnStateData::clientPinnedConnectionRead(), clientProcessRequest(), clientProcessRequestFinished(), ClientSocketContextPushDeferredIfNeeded(), clientSocketRecipient(), clientTunnelOnError(), clientWriteDone(), constructHelperQuery(), Ftp::Server::createDataConnection(), ClientHttpRequest::doCallouts(), doClientRead(), doneAll(), ConnStateData::doneWithControlMsg(), ConnStateData::doPeekAndSpliceStep(), ESIContext::fail(), ConnStateData::fakeAConnectRequest(), ConnStateData::getSslContextDone(), ConnStateData::getSslContextStart(), Ftp::Server::handlePasvReply(), Ftp::Server::handleRequest(), httpsEstablish(), httpsSslBumpAccessCheckDone(), httpsSslBumpStep2AccessCheckDone(), Ftp::Server::listenForDataConnection(), IdentLookup::LookupDone(), HttpRequest::manager(), ACLIdent::match(), ClientHttpRequest::noteAdaptationAclCheckDone(), ClientHttpRequest::noteBodyProducerAborted(), parseHttpRequest(), Ftp::Server::parseOneRequest(), ConnStateData::parseTlsHandshake(), ConnStateData::pinConnection(), ConnStateData::postHttpsAccept(), prepareAcceleratedURL(), prepareTransparentURL(), clientReplyContext::processExpired(), clientReplyContext::processMiss(), clientReplyContext::processOnlyIfCachedMiss(), Http::One::Server::processParsedRequest(), clientReplyContext::processReplyAccessResult(), clientReplyContext::purgeFoundObject(), clientReplyContext::purgeRequest(), readSomeData(), PeerSelector::resolveSelected(), clientReplyContext::sendBodyTooLargeError(), ConnStateData::sendControlMsg(), clientReplyContext::sendPreconditionFailedError(), Http::One::Server::setReplyError(), Ftp::Server::shovelUploadData(), ConnStateData::splice(), ClientHttpRequest::sslBumpEstablish(), ClientHttpRequest::sslBumpStart(), ConnStateData::sslCrtdHandleReply(), Http::One::Server::start(), Ftp::Server::start(), ConnStateData::start(), ConnStateData::startPeekAndSplice(), statClientRequests(), stopReading(), ConnStateData::stopReceiving(), ConnStateData::storeTlsContextToCache(), swanSong(), ConnStateData::switchToHttps(), tlsAttemptHandshake(), ConnStateData::transparent(), tunnelStart(), TunnelStateData::TunnelStateData(), ConnStateData::whenClientIpKnown(), write(), Http::One::Server::writeControlMsgAndCall(), Ftp::Server::writeEarlyReply(), Ftp::Server::writeForwardedReplyAndCall(), and Ftp::Server::writeReply(). Definition at line 110 of file Server.h. Referenced by ConnStateData::buildFakeRequest(), Http::One::Server::buildHttpRequest(), ConnStateData::checkLogging(), doClientRead(), ConnStateData::getSslContextDone(), httpsSslBumpAccessCheckDone(), maybeMakeSpaceAvailable(), ConnStateData::mayNeedToReadMoreBody(), parseHttpRequest(), Ftp::Server::parseOneRequest(), ConnStateData::parseTlsHandshake(), readSomeData(), ConnStateData::startPeekAndSplice(), statClientRequests(), and tunnelStartShoveling(). Definition at line 115 of file Server.h. Referenced by ConnStateData::checkLogging(), ConnStateData::clientPinnedConnectionRead(), clientSocketRecipient(), clientTunnelOnError(), clientWriteDone(), Ftp::Server::connectedForData(), doClientRead(), ConnStateData::doneWithControlMsg(), Ftp::Server::doProcessRequest(), ConnStateData::finishDechunkingRequest(), Http::Stream::finished(), ConnStateData::getSslContextStart(), Ftp::Server::handleDataReply(), Ftp::Server::handleEprtReply(), Ftp::Server::handleEpsvReply(), Ftp::Server::handleFeatReply(), Ftp::Server::handlePasvReply(), Ftp::Server::handlePortReply(), Http::One::Server::handleReply(), Ftp::Server::handleReply(), Ftp::Server::handleUploadRequest(), ConnStateData::httpsPeeked(), httpsSslBumpStep2AccessCheckDone(), Ftp::Server::notePeerConnection(), ConnStateData::notePinnedConnectionBecameIdle(), ConnStateData::parseTlsHandshake(), ConnStateData::postHttpsAccept(), Ftp::Server::processParsedRequest(), Http::Stream::registerWithConn(), Ftp::Server::replyDataWritingCheckpoint(), ConnStateData::sendControlMsg(), Ftp::Server::setDataCommand(), Ftp::Server::setReply(), ConnStateData::splice(), ConnStateData::startPeekAndSplice(), statClientRequests(), tunnelClientClosed(), tunnelServerClosed(), Http::One::Server::writeControlMsgAndCall(), Ftp::Server::writeErrorReply(), Ftp::Server::wroteEarlyReply(), Ftp::Server::wroteReply(), and Ftp::Server::wroteReplyData(). Definition at line 107 of file Server.h. Definition at line 124 of file Server.h. Referenced by doClientRead(), reading(), readSomeData(), and stopReading(). Definition at line 112 of file Server.h. Referenced by doClientRead(), and ConnStateData::switchToHttps(). The transfer protocol currently being spoken on this connection. HTTP/1.x CONNECT, HTTP/1.1 Upgrade and HTTP/2 SETTINGS offer the ability to change protocols on the fly. Definition at line 104 of file Server.h. Referenced by buildUrlFromHost(), parseHttpRequest(), prepareAcceleratedURL(), prepareTransparentURL(), ConnStateData::splice(), and ConnStateData::switchToHttps(). Definition at line 125 of file Server.h. Referenced by clientWriteDone(), write(), and writing().